March is over and I wanted to say a special thank you to a few follow bloggers who featured my posts. My rustic Easter Wreath was featured at Tuesdays at Our Home. Maria Elena recently started up this new linky party and I’m sure it’s going to be a great success! She has a beautiful home and right now she is in the process of redoing a spare room into a craft room. From the looks of some fabulous cabinets that her husband made, it is going to be great! You can visit her blog by clicking here. 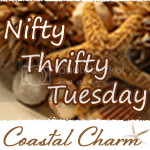 My Trash to Treasure Finds were featured at Nifty Thrifty Tuesday. Linda at Coastal Charm hosts this party each week. She lives on the Gulf Coast, a couple of hours from my area. 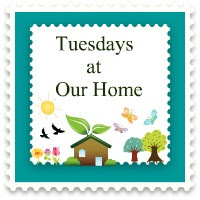 Linda decorates her home with vintage finds. A lot of her finds can be purchased at her shop as well. Once again, thanks to both Maria Elena and Linda! Be sure to stop by and visit them! Thanks for stopping by! Hurray for you, Tammy! You so deserve to be featured! What a beautiful blog and wreath! Thanks for leaving a message on my Crawfish Monica post; I'm usually quick to send a thank you, but life has swallowed me whole as of late. ;) Anyway, I love the look of your blog and look forward to looking through it.